The monthly Assembly meeting of the Istanbul Chamber of Industry (ICI) started with a commemoration of Dr. Hacı Ibrahim Bodur, who passed away last week. Bodur was a founding member of the ICI, and the President of the ICI Assembly from 1976 to 1992. He was one of the “model” industrialists of the young Republic. The session before the meeting included speeches on his exemplary life as well as movies and documentaries. Honorary Members of the ICI Assembly, Hüsamettin Kavi and Ömer Dinçkök, current ICI Vice President of Assembly Ismail Gülle, and ICI Chairman Erdal Bahçıvan took the floor to deliver their eulogies, creating emotional moments at the meeting hall. 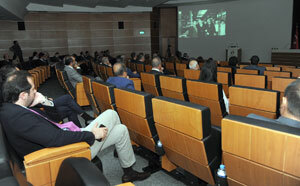 The ICI Assembly May Meeting started with a documentary on Ibrahim Bodur, created by the Bodur family and Kale Group. The session then proceeded with a video compilation by the ICI. The presentations continued with the agenda “An Economic Outlook to the Second Half of the Year from Turkey and the World”. Hosted by ICI Chairman Erdal Bahçıvan and moderated by ICI Vice President of Assembly Hasan Büyükdede, the May Meeting was also attended by economist Dr. Can Fuat Gürlesel who gave a speech on the meeting’s agenda. Erdal Bahçıvan, ICI Chairman, began his words by commemorating Ibrahim Bodur before moving on to share his views on the agenda. During his speech, ICI Chairman Erdal Bahçıvan celebrated Ibrahim Bodur’s life and achievements as a businessman whose funeral brought together all segments of Turkey, and suggested the ecosystem Bodur created in Çan as a model for the new Turkey. “As in his life, Ibrahim Bodur brought together the state and the people together with his passing. Wherever he went, he welcomed people from both Turkey and abroad with open arms,” said Bahçıvan, and reminded that Bodur’s embracing attitude was reflected in his funeral, which he said must be an example for Turkey. “May God grant everyone a life and a farewell such as his. As in his life, Ibrahim Bodur brought together the state and the people together with his passing. He was a proud hajji among fellow Robert College alumni, and a proud Robert College alumnus among fellow hajjis. Wherever he went, he welcomed people from both Turkey and abroad with open arms. His funeral reflects his attitude in life. This must be seen as a model for Turkey. We don’t have to look for other models, including the Japanese or South Korean models. We already have a model at Çan, Çanakkale. It is not an easy task to create an industrial giant out of the arid Çan. His efforts to stand by the regional people in good and bad times are commendable. If we could create fifty similar models across Turkey, if we could combine spiritual values and essential traditions with the requirements of the day, with science and education, we would no longer have to seek any other model. We all must adopt Ibrahim Bodur’s motto, ‘not a love of life, but the joy of facilitating others’ lives’. God willing, this society will create many others like Ibrahim Bodur. Ibrahim Bodur firmly believed that it was impossible for a country to develop by simply consuming without industrializing, creating value and producing; that industrialization would help develop the entire society instead of individuals, and economic prosperity could be achieved only through industrialization. 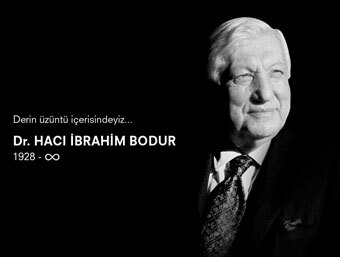 We would like to offer our prayers for Ibrahim Bodur, who will always be remembered for his broad vision, productivity, and his valuable services for our country, economy, and social and educational life, and extend our condolences and sympathy to his family, friends, the Kale Group community, and Turkish industry,” Bahçıvan concluded. 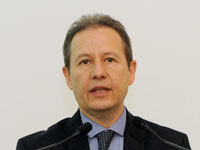 Bahçıvan proceeded to comment on global economic developments. He mentioned that developing countries experienced a slowdown in growth and development and the falling commodity prices in exporter nations such as Brazil and Russia severely stunted growth. According to Bahçıvan, China was another source of significant risk as the slowdown in growth and increased financial risks have been felt more intensely. Bahçıvan anticipated that, in the near future, global economy would keep a close eye on not just the decisions to be made by the Fed, but also the European and Japanese central banks’ decision on whether to carry on with quantitative easing. In the first quarter, Turkish economy exhibited a resilient outlook on both production and consumption sides with private consumption as the main driver of growth, Bahçıvan noted, adding that low oil prices, public expenditure, growing hopes for reform and Central Bank’s interest rate cut supported the positive environment. 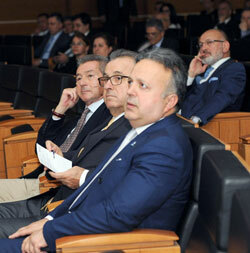 Bahçıvan also stressed that the quality of growth continued to raise questions. According to Bahçıvan, the exports have fallen short of expected recovery and investments failed to reach the intended level despite a slight upward trend. He further expressed that increases in efficiency remained on a limited level and reforms were realized more slowly than necessary. Bahçıvan said that the current account deficit continued to decrease but the sustainability of this improvement was questioned as it was largely associated with energy prices. On the other hand, the slowdown in capital flows caused reductions in reserves, direct investments remained weak, and the deficit was largely compensated through capital inflows of unknown origin. A similar situation was the case for the inflation rate, Bahçıvan emphasized, as dropped food prices and base effects were decisive for the decrease in the CPI-based inflation rate, which had fallen below 7% in April, while the core inflation rate has been maintained at a high level. Bahçıvan told that the decrease in unemployment rates over the past few months were good news, but warned that the growth in employment figures were mostly in the public sector. Bahçıvan stated that the Turkish economy experienced no major problems despite acts of terror, geopolitical problems and global economic risks in the first half of 2016. However, they should act more prudently in the second half due to the existing risks and uncertainties, he said. Bahçıvan drew attention to the significance of the recovery in the EU member states for exporting industries, and noted that they monitored closely any risks to inflation rand current account deficit that might be brought about by the future course of oil prices. He told that tourism industry has suffered a serious blow from geopolitical developments and security concerns, and expressed his worries for an even greater impact to be felt in the second half of the year, the effects of which might be multiplied for industries directly related to tourism. Developments regarding foreign exchange rates would maintain their importance as always, said Bahçıvan, who told that financial stability would play a key role in terms of sustainable growth, given the real estate industry’s vulnerability, particularly against volatile exchange rates. He concluded his words by expressing his appreciation of the new government’s focus on the economy and their hope to see the economic efforts, structural reforms in particular, to be concluded quickly and actively. Gürlesel anticipated a 2.5% growth in the global economy. He told that developing countries experienced a recovery, while energy and commodity producing countries would witness a recession. Gürlesel drew attention to the relatively better performance by the EU and anticipated a weak growth or recession in oil exporting countries. In terms of global commodity trade, commodities sales were higher across the world but dollar inflow remained low due to the exchange rate effect, which pushed exporters to a fierce competition, Gürlesel said. He mentioned the economic outlook of Turkey for the second half of the year; the Middle-Term Program envisaged a 4.5% growth and they expected this figure to be around 4%. Gürlesel also mentioned the significance of funding for Turkey’s current account deficit and pointed out the low level of consumer confidence. Gürlesel told that foreign currency reserves were about USD 19 billion and Turkey lacked sufficient reserves to compensate for a likely interest rate hike by the Fed. Gürlesel said that capacity utilization and industrial production rates increased in the first five months on a year-over-year basis and the ICI’s PMI reflected the course of the first three months, and the later three months’ decrease would also be reflected in it.